Healthcare produces many types of waste, including infectious waste, hazardous waste, pathological waste, specialty wastes such as chemotherapy waste, construction and demolition waste, and solid waste. U.S. hospitals generate about 6600 tons of waste each day and, perhaps surprisingly, as much as 80% of this waste is non-hazardous solid waste, with many opportunities for reduction. In 1998, a Memorandum of Understanding (MOU) was signed by the American Hospital Association and the Environmental Protection Agency (EPA), creating new goals for hospital pollution prevention. This MOU was important because, for the first time, healthcare was called upon to do more than just care for patients – it was asked to care for the environment as well. Ten action steps were originally defined, including elimination of mercury, total volume waste reduction, and chemical waste minimization. One success of the MOU was the elimination of mercury, which is now largely absent from today’s healthcare practices. However, in the case of total volume waste reduction, healthcare still has a long way to go. Practice Greenhealth has gathered data that shows that whereas solid waste costs about $121 per ton for disposal, recycling costs only about $68 per ton. In the current economic climate, the potential savings from recycling should not be ignored. Further, through waste reduction we can realize maximum savings by eliminating the need for disposal altogether, as well as reduce purchasing. Below you will find information about ways to reduce and recycle as much as possible from your healthcare facility. Source Reduction and Reuse: Source reduction, also known as waste prevention, means reducing waste at the source. It can take many different forms, including reusing or donating items, buying in bulk, reducing packaging, redesigning products, and reducing toxicity. Source reduction also is important in manufacturing. Lightweighting of packaging, reuse, and remanufacturing are all becoming more popular business trends. Purchasing products that incorporate these features supports source reduction. Recycling/Composting: Recycling is a series of activities that includes the collection of used, reused, or unused items that would otherwise be considered waste; sorting and processing the recyclable products into raw materials; and remanufacturing the recycled raw materials into new products. Consumers provide the last link in recycling by purchasing products made from recycled content. Recycling also can include composting of food scraps, yard trimmings, and other organic materials. Energy Recovery: Energy recovery from waste is the conversion of non-recyclable waste materials into useable heat, electricity, or fuel through a variety of processes, including combustion, gasification, pyrolization, anaerobic digestion, and landfill gas (LFG) recovery. This process is often called waste-to-energy (WTE). 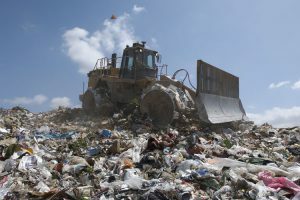 Treatment and Disposal: Landfills are the most common form of waste disposal and are an important component of an integrated waste management system. Landfills that accept municipal solid waste are primarily regulated by state, tribal, and local governments. EPA, however, has established national standards these landfills must meet in order to stay open. The federal landfill regulations have eliminated the open dumps of the past. Today’s landfills must meet stringent design, operation, and closure requirements. Methane gas, a byproduct of decomposing waste, can be collected and used as fuel to generate electricity. After a landfill is capped, the land may be used for recreation sites such as parks, golf courses, and ski slopes. One of the best ways to deal with solid waste in healthcare is to reduce it at the source. In addition to reducing environmental burden, source reduction can reduce purchasing, management, and disposal costs for healthcare facilities. One starting place is to look at disposable products, such as surgical gowns, basins, and forceps. Whereas forty years ago stainless steel bed pans, reusable instruments, cloth bouffants, and other reusable products were common, these items have been replaced by disposable options, because these products are perceived of as cheaper, easier, and safer. What often is not taken into account is the environmental costs of disposable items. For example, in a joint study from the University of Minnesota Health (formerly the University of Minnesota Medical Center, Fairview) and MnTAP, reusable isolation gowns were compared with disposable isolation gowns from a lifecycle perspective, including manufacturing, trucking, and packaging inputs. Though the disposable option costs a few cents less per gown, it also had a far greater environmental impact. The average output of carbon emissions (CO2) over the lifecycle of a disposable gown was found to be 3.0 Kg; versus 0.29 Kg for a reusable gown. MnTAP also conducted a Reduce Blue Wrap Waste with Sterilization Containers intern project at St. Luke’s Hospital in Duluth to study the sustainability benefits of switching from disposable surgical blue wrap to sterilization hard cases for surgical cases. They found that by purchasing 224 additional hard cases, that the hospital could reduce its surgical blue wrap waste by 5.4 tons annually. An area with great source reduction potential is patient supplies. Examine the supplies that are typically assigned to patients to see whether each piece need be included or whether items could be pulled from shelves on an as-needed basis. For example, in 2009, MnTAP conducted a project at the University of Minnesota Health in Minneapolis with assistance from thoracic surgeon Rafael Andrade, MD to reduce redundant or unnecessary items from his standard surgical kits. The result was a $50 cost savings and one-pound reduction in waste from each pack used by Dr. Andrade for his port placement procedure. To learn more, read the project case study: Reducing Waste from the Operating Room. Dr. Andrade continued this work with a project that looked at wastes associated with two similar medical procedures, mediastinoscopy (MED) and endobronchial ultrasonography (EBUS-TBNA), showing that the MED procedure created 3.6 times as much waste as the EBUS-TBNA procedure. His paper was published in the Annals of Thoracic Surgery. This work resulted in the Healthier Hospitals Initiative adding “surgical pack reduction” to its list of challenges for hospitals attempting to reduce waste and engage in smarter purchasing. Another strategy is to purchase items using a “just in time” (JIT) model. JIT models allow supplies to be ordered and delivered within a day or two, thus freeing up space on shelves and also reducing waste due to outdated supplies. With a JIT model, healthcare facilities also keep close tabs on supplies that are currently in-stock and are able to rotate them through different departments so as to avoid outdates and unnecessary supply waste. Healthcare can also work with supply manufacturers to deliver products in condensed packaging so as to remove unnecessary packaging from the waste stream. Healthcare facilities may also wish to explore medical equipment liquidation. Equipment liquidators will come to your site and give you a purchasing value for the equipment. The equipment does not need to be in working condition, although working equipment commands a higher price. Companies in Minnesota who provide this service include MIGA and Scientific Equipment Liquidators. Healthcare facilities can also purchase items from liquidators. This might be a good option to explore, especially if you need only one or two of a particular item. Surplus equipment in working condition, as well as office supplies and furniture, can also be listed on the MN Materials Exchange. Finally, there are many charities that will accept household-type donations, such as couches, television sets, and bookcases. Salvation Army, Goodwill, and others will accept these types of items if they are clean, working, and in good condition. The first strategy to reducing food waste is to reduce the amount you prepare through meal planning, staff training, and other strategies. However, there are always instances of good food being left-over from meal times, and food donation is a great option for putting it to good use. Although there are many situations that preclude food donation, there are some instances where this might be an option for your facility. Food pantries like Second Harvest Heartland will pick up food that has been stored in keeping with their temperature and time requirements and bring it to shelters or food pantries for distribution. If you are interested in this option, call Second Harvest Heartland or your local food pantry to learn more. The EPA also maintains a Feed Families, Not Landfills page that can help you learn more about food donation. Whereas reduction means not purchasing or using an item in the first place, and reuse refers to using an item again as-is, recycling refers to reprocessing materials into new items. Commonly recyclable items include paper and cardboard, aluminum cans, and plastic and glass bottles. These items may be collected separately or together in a single-stream recycling container. Recycling services are typically less expensive than trash, as recycling is not taxed whereas trash is. Thus recycling, like reduction and reuse, can be viewed as a cost savings initiative as well as an environmental one. There are, however, materials that cannot or should not be recycled in healthcare. Glass medication vials are not usually appropriate in the recycling stream, since the medications can be washed into the sewer during processing. Styrofoam is another item not easily recyclable, and a reduction strategy is your best bet. For assistance in determining what is appropriate for recycling and what isn’t, contact your recycling hauler. Sterilization blue wrap is a product unique to the healthcare industry, and although reduction is best, Minnesota Waste Wise does offer a blue wrap recycling program in some locations in Minnesota, primarily in the Twin Cities metro area. Contact Minnesota Waste Waste to see whether this service is offered in your area. Minnesota Waste Wise also has a program for collecting ink cartridges and small electronics, like cell phones. The ink cartridges and small electronics program is free for anyone, and is handled via U.S. Mail. Reprocessing is also unique to healthcare. Reprocessing refers to the collection of single-use devices (SUDs) for cleaning and remanufacture. The devices are then resold at a fraction of the cost of a new SUD. There are currently two companies who perform this service in the U.S. SterilMed is headquartered in Maple Grove, Minnesota, and Stryker Sustainability Solutions is headquartered in Tempe, Arizona. It is estimated that more than 3,000 hospitals participate in some form of reprocessing, and the industry is regulated by the FDA. Sometimes, reprocessing is offered directly through original equipment manufacturers as well. For stretch films and plastic wrap/bags, the Recycling Association of Minnesota (RAM) offers the It’s In the Bag program. In a healthcare setting, this may include clean patient belongings bags, the plastic wrap used to cover clean linen and supply carts, and packaging materials. Visit RAM’s website to learn more about this program. Some facilities have difficulty collecting and sorting recyclables from their waste stream, and some are now using nonprofit workforces who provide employment opportunities to disabled adults. In the Twin Cities, both Partnership Resources Inc. (PRI) and Merrick Inc. have programs in place through which their staff come to your facility on a regular basis to collect recyclables and haul them to your recycling compactor or dumpster. The cost savings from recycling typically far outweigh the fee for the services they provide, making this a “win-win” program. Construction waste is very easily recyclable in Minnesota. Construction waste recycling dumpsters are offered by many companies. The best place to find a construction waste recycler is to visit the Minnesota Pollution Control Agency’s Minnesota Recycling Markets Directory or, if your facility is located in the Twin Cities, Rethink Recycling. There are many things that can also be reused from construction sites, and this option should be explored before recycling is considered. One notable program is the Habitat for Humanity ReStore, to which building materials can be donated and purchased across the state. Visit their website to find store locations. To learn more about recycling electronics and battery waste, visit the Universal Waste page. Organics materials include kitchen scraps, yard waste, non-recyclable paper products (e.g. napkins and paper towels), and products that are designed to be compostable (e.g. BPI-certified compostable drinking cups, plates, and flatware). Organic materials are often collected in plastic barrels lined with compostable bags, and then the bags are placed in a dumpster or compactor. The materials are transported to a composting facility, where they are processed into compost, a nutrient-rich topsoil. The EPA offers a good overview of the composting process and the benefits of composting on their Composing for Facilities page. Composting is becoming more common nationally and in Minnesota. Contact MnTAP if you are interested in exploring whether organics recycling is viable at your facility. If you do not have access to composting services, consider composting your own scraps on-site for use in a community garden. Another option is food-to-hogs programs, which send food scraps to pig farms. Barthold Recycling is one such provider, though there may be others in your area. In this case, plastic barrels are used to collect food scraps from your kitchen/nutrition department, and the barrels are picked up and exchanged for clean ones. Food-to-hogs is higher on the waste management hierarchy than composting, but only food scraps can be included (no paper products, compostable items, or other non-food organic materials). In some locations around Minnesota, waste is burned to create electricity instead of being sent to a landfill. This falls below recycling but above landfilling on the waste management hierarchy. There are nine waste-to-energy in Minnesota: Great River Energy in Elk River, Hennepin Energy Resource Co. (HERC) in Minneapolis, Olmsted Waste-To-Energy Facility in Rochester, Perham Resource Recovery Facility in Perham, Polk County Solid Waste Resource Recovery Plant in Fosston, Pope/Douglas Solid Waste Management in Alexandria, Red Wing Resource Recovery in Red Wing, Xcel Energy – Red Wing Steam Plant in Red Wing, and Xcel Energy – Wilmarth Plant in Mankato. More energy is saved through reduction, reuse, and recycling than through waste-to-energy, so efforts should focus on reducing and diverting waste as much as possible. Landfills are the most commonly used disposal method nationally and in Minnesota. Landfills are regulated by the Minnesota Pollution Control Agency (MPCA) with strict oversight. Landfilling should be the last method used, once all options for reduction, recycling, and recovery have been exhausted. Finally, backyard burning and burying are illegal; visit the MPCA’s Laws Prohibiting Backyard Burning for more information. We recommend using the checklist below to help assess your waste and develop plans for reduction and recycling. What is in the dumpster? Can prominent items be reduced? Are there recyclables in the trash? Where did the waste come from? Could production/process waste be reduced? Would separating out food and compostable waste make sense? Are there reusable cups, plates, and silverware? Are recycling containers accessible and clearly labeled? Is there non-toxic soap and/or cleaners? Are there paper towels or reusable towels? What is in the trash? Is there food prep/waste? Is composting an option? Is the default set to duplex? Is second chance paper recovered? Are remanufactured toner cartridges used? Are empty cartridges recycled? Have employees reduced document margins? Are there recycling bins nearby? Does the paper have recycled content? Are there items with recycled content where possible? Do supplies have post-consumer recycled content? Are there reusable plates, cups, silverware and trays? Are disposable options recyclable or compostable? Would composting make sense at this facility? Are there products with unnecessary packaging? Do paper towels, toilet paper and other products have recycled content? Are there non-toxic alternatives to products currently being used? Could they use fewer cleaners? How do they store or dispose of fluorescent bulbs? Are hazardous materials kept separate for proper disposal? Do employees use mugs and or reusable cups for coffee and water? Are paper reduction practices used? Is there easy access to recycling containers? Are there single serve items that could be replaced by bulk items? Are trash and recycling located near each other? What items are collected for recycling? Could additional items be collected? Are there recyclables in the trash? Or trash in the recycling? Are there proper disposal options for “oddballs” like e-waste, CFLs, and printer and copier cartridges? Are you repairing, refurbishing, or reusing equipment? Are you donating clean, unusable supplies to medical mission groups? Are you using a liquidator for broken or unneeded medical equipment? Are you donating household supplies and furniture when possible? Have you tried a paper reduction campaign? Have you organized fun activities to promote recycling? Have you had a waste sort performed to identify reduction opportunities? Have you contacted MnTAP for a waste evaluation?